The popular One Hour Dress, a pattern available all over the internet, but easy to draft at home in no time at all! 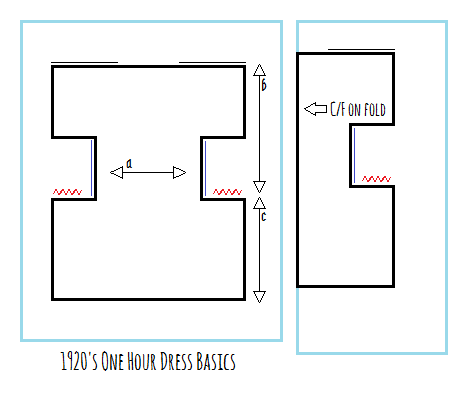 When I starting making two new 20's dresses this past week I based the pattern on the most basic of the one-hour dress models. At the patterns most basic level, I have found you will really only need three measurements. The pattern for the 1920's one hour dress is essentially a rectangle with extra extensions for the sleeves and hip fullness. The starting rectangle is the width of 1/2 of your bust measurement (so if your bust measurement is say 40", the rectangle will be 20" across). The sleeve extensions are created by dividing measurement b. by two to determine the depth of the sleeve. You can extend the top edge as wide as you would like, the wider it is the longer your sleeve. For sewing the dress together, I like to start by hemming the top edges first and then sewing the seams at the shoulders from the edge of the sleeve towards the neck. Leave enough space for the boat neck style neck opening to fit over your head. Then, right sides together, sew the side seams together. Gather or pleat (where the wiggly red lines are above) the skirt extensions and sew down to waist flat. Hopefully that made some sense! 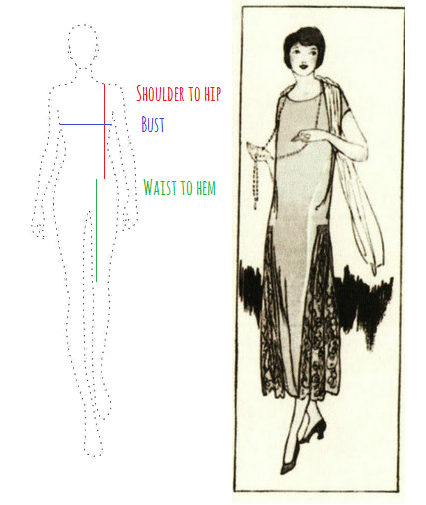 The above pattern results in the most basic of 20's dresses with a high neck. I think it looks really nice in a sheer flowy fabric worn over a simple slip. For a simple variation, just change the shape of the skirt. When modifying the skirt I think it is easier to separate the bodice and the skirt into two pieces that will be re-attached at the waist, but I suppose if you had wide enough fabric you could make it in one piece. Once you change to a larger skirt shape, like those in various colors above, you no longer gather the skirt to the waist but simply sew along the extension to close the full side seam. By changing the skirt shape, the hem becomes like a handkerchief hem and can be really beautiful in a sheer fabric! I like the high boat-neck neckline with long 1920's style beaded necklaces but you can change the neckline to whatever you like and finish it by adding a facing on the inside. You can remove the sleeve extensions entirely and either add arm hole facings or bind with bias tape. With a different measurement, from the top of the bust (instead the top of the shoulder) to the hip you can change from a sleeve to a strap. 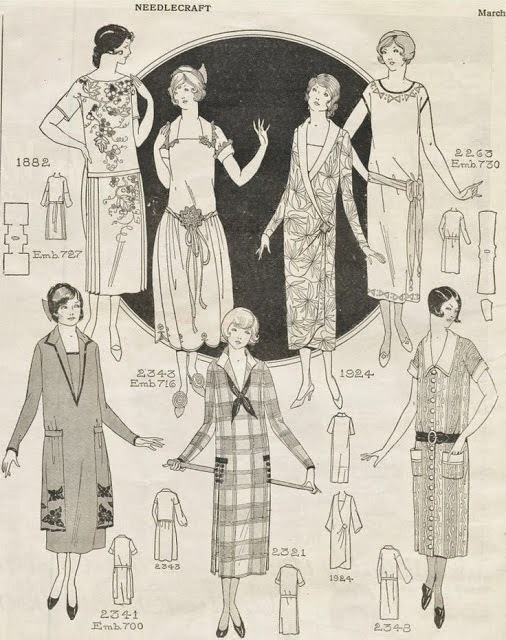 The best thing about this basic 1920's pattern is you can modify it really easily. So much of the 20's shape is geometric and that translates to the patterns as well. I am still experimenting with this pattern, but this is what has been working for me so far. I'll show you the results of my 1920's dressmaking experiments later this week! Hi Bianca, I just discovered your blog. This post is such an inspiration - I love the 1920"s. Val. This is great! I have been searching for a simple shift dress pattern. Thank you so much for sharing. i love this! we are hosting a Roaring 2020 party...so I am looking for ideas now. I love the idea of a 2020 bash, it will soon be the twenties again! I'm not sure how to explain it really so I may have to take photos of an example. I would say the main thing is to not try to gather all of the fullness into the same spot, like spread the gathering out across a couple inches and then sew that down. I'll try and make an example of what I mean and put it up soon! I had the same issue-- and because I was making the dress for a last-minute invitation to a 20s-themed party, I just had to hide it with a sash. :) But Bianca, your post let me show up looking decent and I am grateful! Thanks! It has been so long since I made one with gathers at the side I don't actually remember what order I did the steps in for that method. I'm going to do a whole post on the different options on how to do the side hip fullness, so that will be coming soon! Thanks for writing such a wonderful blog! I have some questions about the drafting... I wonder if you could clarify. When you say the measurement is across the bust, do you mean the front bust only? What about ease? Does it fit closely at the bust? The bust measurement for drafting this dress is the measurement all the way around the body at the bust point level. Because this style has a bit more width through the bust thanks to the extension out for the sleeves I have never had trouble with needing to add ease, but you certainly could feel free to add some ease to the pattern as 1920's clothes were often looser as opposed to form fitting. Seeing your comment on this post from a few years ago makes me realize I really need to write an updated and improved version of this tutorial so I will do that soon! Thank you! No, thank you! 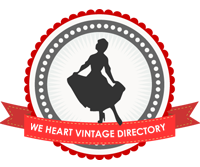 Your blog is a wonderful resource!